Houston Mayor Sylvester Turner Proclaims June 4th, 2017, Great Age Movement Day! 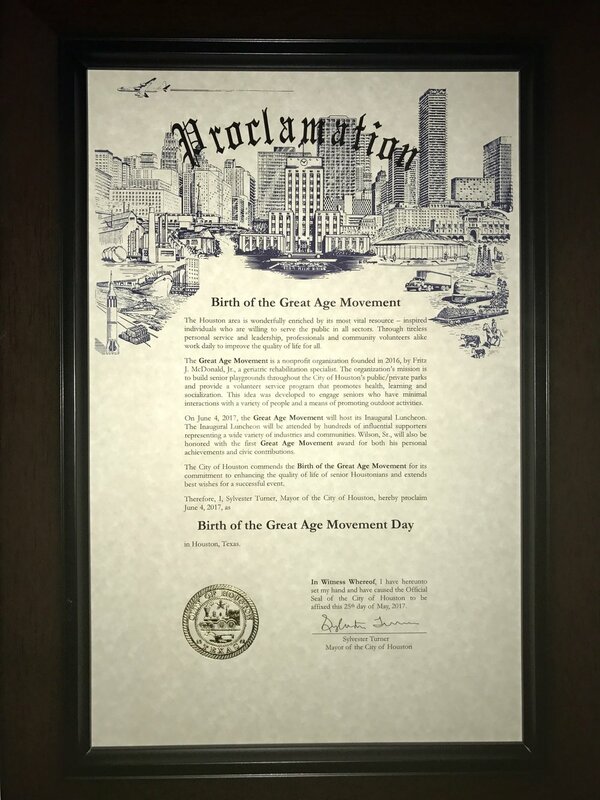 Birth of the Great Age Movement organization happened this past summer on June 4th, 2017, with a proclamation day declared by Houston's Mayor, Sylvester Turner. Our inaugural luncheon introduced the organization to the general public including our purpose, mission, and goals to better serve our seniors through community initiatives. Our event raised over $50,000 which will help fund our first senior playground in the near future. We continue to foster relationships with city leaders to bring our important project to light. We look forward to sharing our progress with local communities. Go G.A.M. !